Dear Mother: verything [everything] is all right -- don’t worry. Love, Cleve. Mrs. Bonisteel said today: I was prety [pretty] sick when I heard the rumor and when many people called me. I wrote the Government to check on the report and apparently they did, for Cleve wired me the above cablegram. Gnr. Cleve Bonisteel who was born and raised in Lindsay, attended both the public school and the Collegiate Institute here. Following school he was employed with Fee Motors and W. Langdon, and afterwards with Giles, Rice and Peters, automobile firm in Toronto. He enlisted at the outset of war with the 45th Battery in Lindsay and trained at Petawawa. He went overseas with the Battery over three years ago and has been in England and somewhere in France ever since. He has been in the thick of many a battle, but he never tells me a word about it said Mrs. Bonisteel. 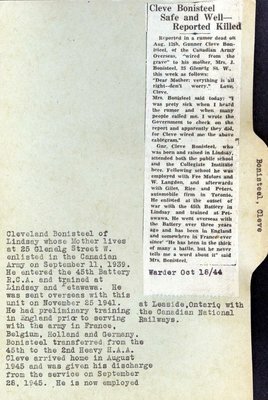 Cleveland Bonisteel of Lindsay, whose mother lives at 25 Glenelg Street W. enlisted in the Canadian Army on 11 September 1939. He entered the 45th Battery R.C.A. and trained at Lindsay and Petawawa. He was sent overseas with this unit on 25 November 1941. He had preliminary training in England prior to serving with the army in France, Belgium, Holland and Germany. Bonisteel transferred from the 45th to the 2nd Heavy H.A.A. Cleve arrived home in August 1945 and was given his discharge from the service on 28 September 1945. He was then employed at Leaside, Ontario, with the Canadian National Railways.